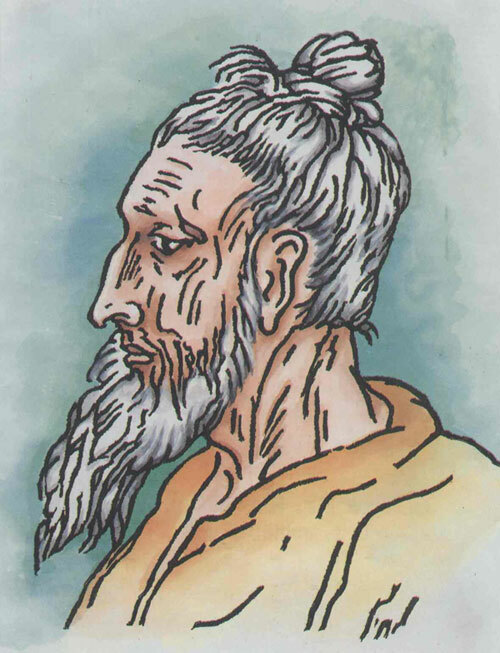 Fakir Lalon Shah, also known as Lalon Shah (c.1774-1890), lived in the village of Cheuria in the area known as Nodia during pre-colonial, undivided Bengal and which is the District of Kushtia in present-day Bangladesh. Lalon intentionally kept his place of birth and the identity of his parents unknown. Around the age of sixteen he was found floating by the bank of Kaliganga river, suffering from smallpox. He was taken to the home of Seraj Shah and his wife Matijan, who brought him up. Lalon left no trace of his birth or his 'origin' and remained absolutely silent about his past, fearing that he would be cast into class, caste or communal identities by a fragmented and hierarchical society. Despite this silence on his origins, communal appropriation of this great politico-philosophical figure has created a controversy regarding whether he is 'Muslim' or a 'Hindu' -- a 'sufi' or a follower 'bhakti' tradition -- a 'baul' or a 'fakir', etc. He is none, as he always strove to go beyond all politics of identities. Lalon does not fit into the construction of the so called 'bauls' or 'fakirs' as a mystical or spiritual types who deny all worldly affairs in desperate search for a mystical ecstasy of the soul. Such construction is very elite and middle class and premised on the divide between 'modern' and 'spiritual' world. It also conveniently ignores the political and social aspects of Bengal's spiritual movements and depoliticizes the transformative role of 'bhakti' or 'sufi' traditions. This role is still continued and performed by the poet-singers and philosophers in oral traditions of Bangladesh, a cultural reality of Bangladesh that partly explains the emergence of Bangladesh with distinct identity from Pakistan back in 1971. Depicting Lalon as 'baul shomrat' (the Emperor of the Bauls) as projected by elite marginalizes Lalon as a person belonging to a peripheral movement, an outcast, as if he is not a living presence and increasingly occupying the central cultural, intellectual and political space in both side of the border between Bangladesh and India (West Bengal). Lalon has composed numerous songs and poems which depicts his philosophy.Among his favorite songs are khachar bhitor auchin pakhi, jat gelo jat gelo bole, dekhna mon jhokmariay duniyadari, paare loye jao amay, milon hobe koto dine, aar amare marishne maa, tin pagoler holo mela, etc. Lalon is one of the most brilliant and philosophically insightful minds born in oral and textual traditions who expressed his ideas in beautiful songs and wonderful musical compositions using instruments that could be made by any rural households from materials available at home: an Ektara (a one string musical instrument) and a Dugdugi (a hand drum). The texts of the songs was explicitly written to engage in the philosophical discourses of Bengal continuing since Tantric traditions of the subcontinent, particularly Nepal, Bengal and the Gangetic plains. In Lalon one finds critical re-appropriation of the various philosophical positions emanating from the legacies of Hindu, Jaina, Buddha and Islamic traditions developing into a coherent discourse without falling into the mixes of being syncretic. He is definitely going to occupy a central position in various ecological, feminist and politics of care and responsibility aiming radical transformation of the society. In recent years Lalon has inspired Nayakrishi Andolon (New Agricultural Movement), the well known biodiversity-based ecological movements of the peasants of Bangladesh as well as inspiring young musical generations to build upon his oral and musical foundations. Lalon Shah had a perceptible influence on the poet Rabindranath Tagore, who introduced the Baul tradition of Bengal to the world. His own music had been influenced by the diversity of Baul tradition. In 1963, a mausoleum and a research centre were built at the site of his shrine, the place of knowledge-practices. Thousands of people come to the shrine known in Bengali as akhra twice a year, Dol-Purnima, in the month of Falgun (February to March) and in October, on the occasion of the anniversary of his death. During these three-day song melas, people, particularly fakirs and bauls pay tributes to this great mind the subcontinent has produced. American poet Allen Ginsberg was inspired by Lalon Shah in writing his poem After Lalon, included in the poetry collection "Cosmopolitan Greetings." Ginsberg adopts a poetic style similar to Lalon's own style, frequently repeating his own name within the poem. Among the modern singers, Farida Parvin is definitely the most notable one as she has recorded so far 300 songs composed by Lalon Shah.